A little April Fool’s Day fun. April 1, 2015 (La Mesa) –After planners twice rejected proposals for an 18-story and 10-story high rise mixed use development at Spring Street and Baltimore Drive in La Mesa, the developers of Park Station have submitted alternative plans aimed at doing more with less. 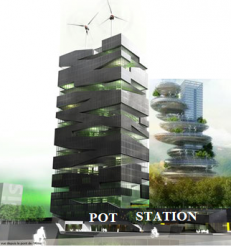 The new plan will include a vertical cannabis farm, cubicle style hotel, community garden, lounge and rotating restaurant powered by renewable energy.